Penthouse # 1 è un magnifico noleggio unico a Chicago. Sovrastante la città, con aree abitative spettacolari e un camino squisito, questo attico offre il massimo per vivere in città. Riguarda i punti di vista e la posizione. Dalle finestre dal pavimento al soffitto di 20 piedi la città si svolge davanti a te con il Lago Michigan come sfondo; da nessuna parte a Chicago puoi stare con punti di vista come questi. Confina con l'eleganza e il glamour di North Michigan Avenue a est e la raffinata arte del River North District a ovest, Penthouse # 1 è al centro di uno dei quartieri più eccitanti di Chicago. La vita qui è condita da shopping di classe mondiale, il meglio di ristoranti informali e raffinati, gallerie e club. Ogni bagno con asciugacapelli, Q-tips e make-up pad. We absolutely enjoyed our stay in this amazing Penthouse! The location could not be beat and enabled us to walk her so many different places or jump on the L to get around. The views cannot be appreciated by the pictures! The condo was fully equipped with everything we needed as we made several meals at the condo. The gentleman that worked the front desk were extremely helpful and polite. Just be sure and bring eye covers for when you sleep as the floor to ceiling windows means a whole lot of light comes in 1st thing in the morning! But we were glad to have it to have those views! The penthouse had everything we needed. The view was great and it’s easy to walk everywhere. Check in and checkout was a breeze. We would definitely stay there again. Brad thanks for your visit and review. We trust that you will consider staying on your next trip to Chicago! Cool condo with GREAT views, location, amenities....what's not to love? I lived in this area in the mid 1980's and still believe it to be one of the best locations in Chicago to explore the Loop, Mag Mile and Gold Coast area, and have subway access at the door, AND east on/off 90/94, if coming by car. The owners have thought of everything; this is the best equipped vacation rental we have ever stayed in. Owners Jim and Jeri-Lou are professional and pleasant to deal with, as are the lobby staff. The elevators are SUPER fast, with no waiting - an important concern at this height. Note that the two 2nd floor bedrooms share the master bath, which means going into the master bedroom, or going back downstairs. Not a concern as we were all family on this trip. 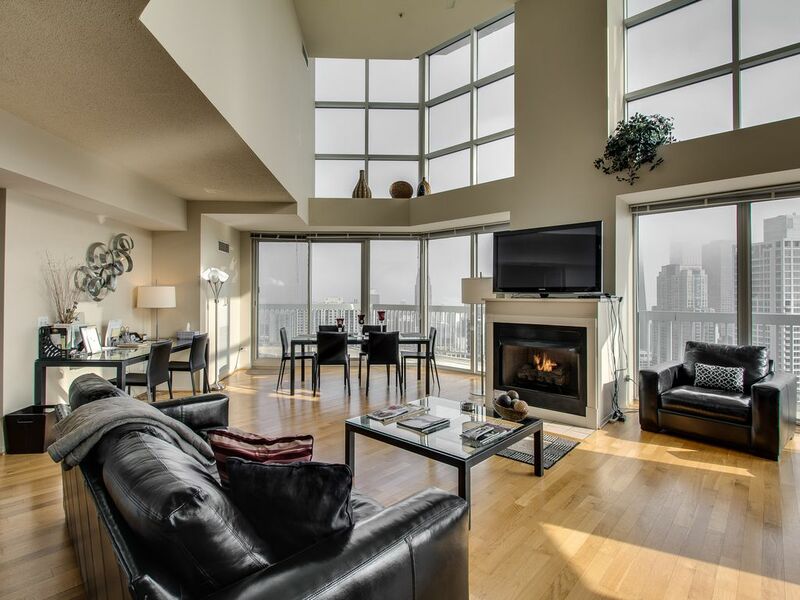 The condo itself is a truly impressive space, and makes a memorable vacation rental. We would rent this unit or another from this owner again. Thanks you for your visit and your comments. So glad help make you stay a memorable one! Yes, the location is perfect. With a walk score of 100. Big shout out to our Doorstaff, they are the best in the city!! You can’t find better views anywhere in Chicago. This condo is in a great location with owners that go out of their way to work with you. We will be returning. Thanks for your visit. These unit have won awards for the best city view in the world. Looking forward to your return visit! We loved our stay in the penthouse..would definitely rent it again! We had a nice romantic weekend. Limited DISCOUNTED parking is available at $34/day.